It’s easy for tennis fans to forget how lucky they are being right here, right now. The men’s game is in a beautiful place, involving gripping rivalries between players who will become (or who already are) all-time greats. Federer, Djokovic, Nadal and, on the outside but closing in, Murray – these are some of the game’s best-ever players competing during arguably the game’s best-ever era. It wasn’t always thus because it hardly ever is. In fact, you have to go all the way back to the late 1970s for a similar set-up involving Borg, Connors and McEnroe. Connors was a bit of a brat. McEnroe was Superbrat. Bjorn Borg? Borg was just class. He came, he conquered, he cleared off, turning pro in ’73 and calling it a day just a decade later at the age of 26. In between, he threatened to break countless Grand Slam records and enjoyed – yes, that is the right word – a quite phenomenal rivalry with John McEnroe. If his career was, for the most part, a textbook display of achievement, his ascent was anything but. A curious marriage of ping pong and ice hockey helped mould the Swedish tennis great. 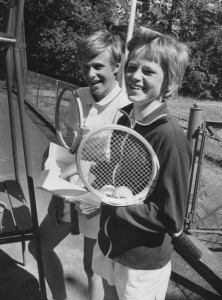 His father won a table tennis tournament and the young Bjorn was fascinated by the prize – a tennis racket. Borg Snr duly handed it over and set Bjorn on the road to tennis greatness. The Swede’s trademark double-handed backhand was nothing new. Players had used, and won with, the technique since at least the 1930s, but Borg’s backhand was a potent offensive weapon and an unyielding defensive attribute. How he came to rely on it was down to his love of ice hockey. He adapted that sport’s slap shot and tuned it into one of the most recognisable tennis shots of the 1970s. Allied to his speed, anticipation and endurance, it brought him victory after victory and 11 Grand Slam titles. But what finally defined him was an opponent – John McEnroe – and their epic Wimbledon encounters. 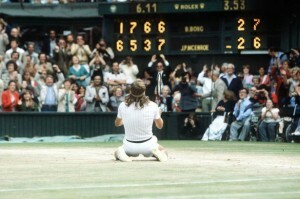 The best of all – and possibly of all-time – was the 1980 Wimbledon final. It was the perfect match-up: the defending champ a baseliner supreme; the upstart American challenger a serve-and-volley diamond in the rough. Borg was self-contained and supposedly ice-cool, his athleticism running contrary to his pigeon-toed and round-shouldered gait. He favoured control, under-statement and defence. McEnroe was all offense – often in every way possible. He was flamboyant, emotional and never more than a close call away from picking a fight with officials, the crowd and sometimes even himself. The pair really were made for each other. Five sets of gruelling, astonishing tennis ensued, including a fourth set tie-break that McEnroe won 18-16. Borg prevailed, eventually, and sunk to his knees as if the enormity of it all – the match, the struggle, the occasion – had hit him all at once. Hindsight has left the American in no doubt as to how great it all was. “Of all the matches I’ve played, that was the one where you felt a real buzz – in that tie-break especially,” he said. For Borg, it was his fifth straight Wimbledon title. A record sixth consecutive crown eluded him, thanks to McEnroe. And within six months, Borg had jacked it all in. “It took many years to come to terms with myself and to discover what I really wanted to do,” he explained. “I had many choices and tried lots of things, some good, some bad. Businesses and relationships came and crashed. Comebacks were attempted and quickly ditched. Borg’s life was in danger of descending into child-star destruction – a precocious peak followed by a dark and desperate emptiness. He was saved, of all things, by underwear. Yes, underwear. These days, you can buy into the Borg brand by purchasing a pair of Bjorn undercrackers. It’s a thriving concern, apparently, and it’s helped Borg find peace with himself though global success away from the tennis court. He still watches the game and has a stake in it. The game, and in particular his rivalry with McEnroe, made him, after all. But it no longer defines him. And the world is happy for him. We have a great selection of hand-signed Bjorn Borg memorabilia (but no pants) – part of our growing tennis collection.